When following a vehicle on a dusty metal (gravel) road, what should you do? When following a vehicle on a dusty metal (gravel) road, what should you do? Select all that apply. When following a vehicle on a dusty metal (gravel) road, what should you do? Select all that apply. Slowing down so you're not blinded by the dust cloud is the thing to do. It also minimises your chance of a stone flying up and cracking your windscreen. Having your lights on increases your chance of being seen by drivers coming in the other direction, particularly if you are partly obscured by the dust cloud of a driver ahead. 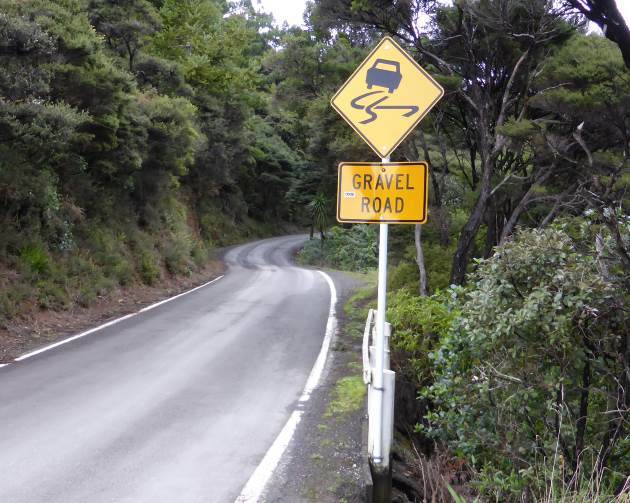 If you are approaching a gravel road you could see a sign like this one on the road out to Whatipu west of Auckland. Gravel roads are cheaper to maintain than asphalt roads. There are still many gravel roads in New Zealand in rural areas, and even, as you can see in this case, not far from main cities. When gravel roads are wet, they don't provide problems with dust, but in the summer the dust can obscure other drivers' vision for several hundred metres behind you and, if you meet a vehicle coming towards you, its dust can be a problem for your visibility. Gravel roads still suffer from degradation, though. Gravel is lost over time through the road geometry (e.g. whether it's on an incline or flat), how good the drainage is (water washes away gravel), the type of gravel used, how frequently it is maintained, how much traffic passes over the gravel (gravel gets stuck in tyre treads and is taken away), and wind (wind can blow gravel if it's strong enough). If the road has flat areas, e.g. the crossfall (the gradient from the crown of the road to the edge) is less than 4%, water is likely to pool and weaken the road surface, causing potholes. Conversely, grades of more than 8% are discouraged because the road surface is not strong enough to withstand the acceleration forces of heavier vehicles. In this case, the incline might be sealed. When gravel is added back to the road it is called re-sheeting. When the road surface is scraped back to flat it is called grading and it's graded with a grader. Austroads (2003) suggests that an average daily traffic level of 150 vehicles or more justifies a single lane gravel road being formed as a two-lane gravel road. At intersections with sealed roads, the seal is usually extended to reduce the amount of gravel introduced onto the seal road, and to make turning off the sealed road onto the gravel road safer. For more information about driving with limited visibility click here.